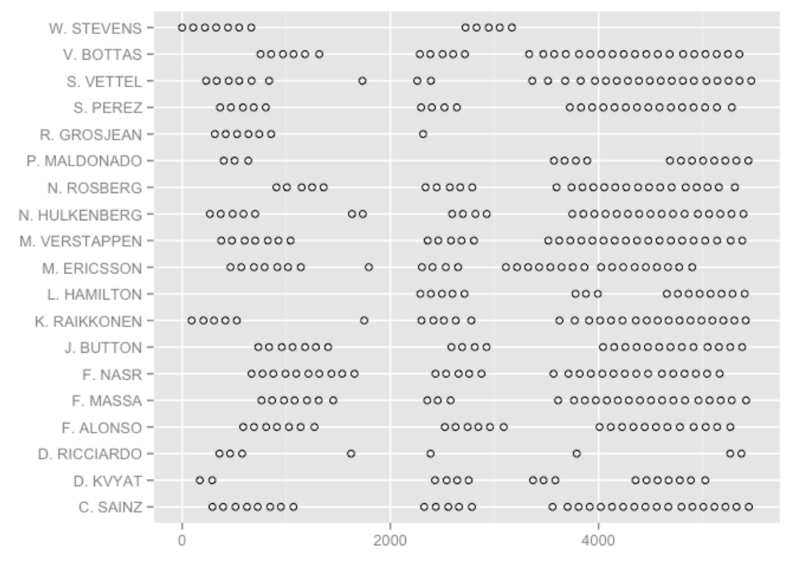 One of the things I’ve been trying to explore with my #f1datajunkie projects are ways of representing information that work both in a glanceable way as well as repaying deeper reading. I’ve also been looking at various ways of using text labels rather than markers to provide additional information around particular data points. For example, in a race battlemap, with lap number on the horizontal x-axis and gap time on the vertical y-axis, I use a text label to indicate which driver is ahead (or behind) a particular target driver. In the revised version of this chart type shown in F1 Malaysia, 2015 – Rosberg’s View of the Race, and additional numerical label along the x-axis indicatesd the race position of the target driver at the end of each lap. Two closer readings of the chart are then possible. Firstly, by looking at the y-value we can see the actual time a car is ahead (and here the dashed guide line at +/1 1s helps indicate in a glanceable way the DRS activation line; I’m also pondering how to show an indication of pit loss time to indicate what effect a pit stop might have on the current situation). Secondly, we can read off the labels of the drivers involved i a battle to get a more detailed picture of the race situation. 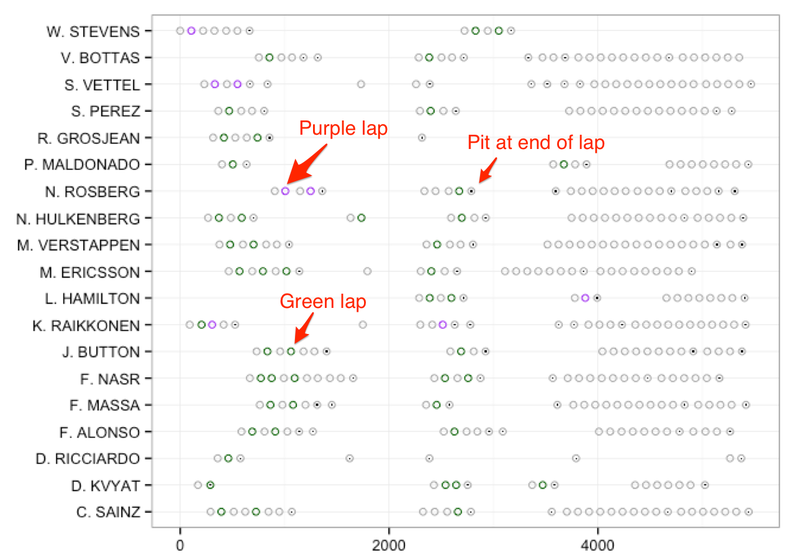 The charts show how each driver made use of a practice session or qualifying – drivers are listed on the vertical y-axis and the time into the session each lap was recorded at is identified along the horizontal x-axis. This chart makes it easy to see how many stints, and of what length, were completed by each driver and at what point in the session. Other information might be inferred – for example, significant gaps in which no cars are recording times may indicate poor weather conditions or red flags. However, no information is provided about the times recorded for each lap. But still, no meaningful lap times. One thing to note about laptimes is that they come in various flavours, such as outlaps, when a driver starts the lap from the pitlane; inlaps, or laps on which a driver comes into the pits at the end of the lap; and flying laps when a driver is properly going for it. There are also those laps on which a driver may be trying out various new lines, slowing down to give themselves space for a flying lap, and so on. 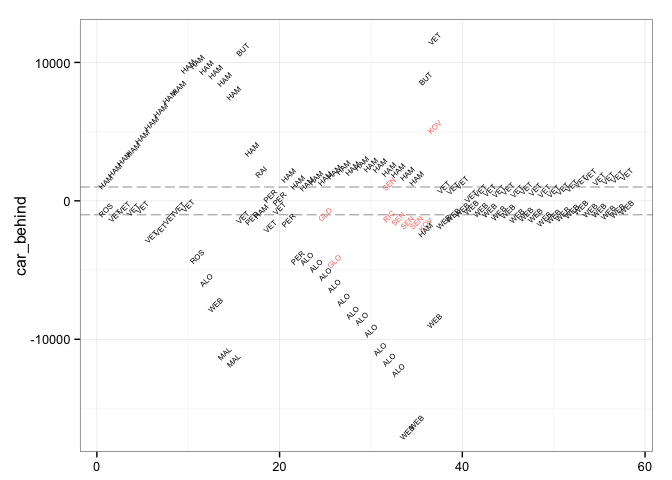 The chart is produced using ggplot, and a layered approach in which chart elements are added to the chart in separate layers. 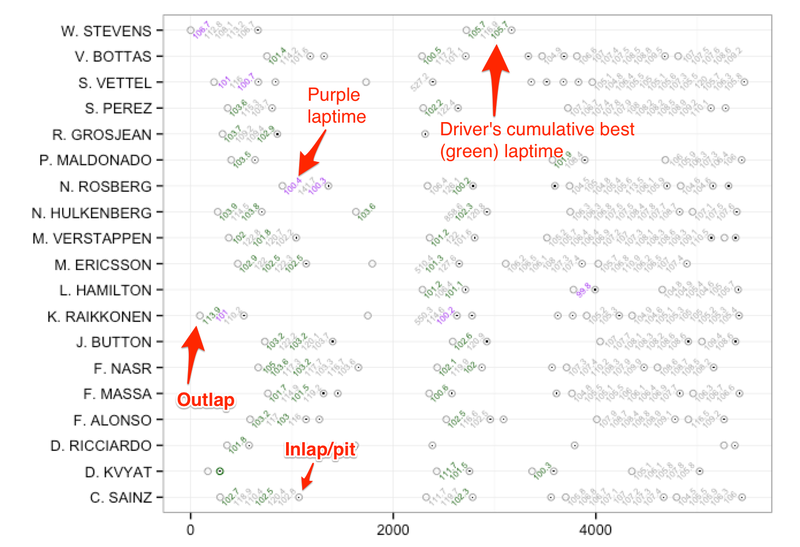 This version of the chart has the advantage of being glanceable when it comes to identifying session utilisation (number, duration and timing of stints) as well as when purple and green laptimes were recorded, as well as repaying closer reading when it comes to inspecting the actual laptimes recorded during each stint. To reduce clutter on the chart, laptimes are round to 1 decimal place (tenths of a second) rather than using the full lap time which is recorded down to thousandths of a second. Session utilisation charts are described more fully in a forthcoming recently released chapter of the Wrangling F1 Data With R Leanpub book. Buying a copy of the book gains you access to future updates of the book. A draft version of the chapter can be found here. In my hero car oriented software, where the hero car is the zero reference line, I use ablines to indicate this. Discussed here http://p1software.com/p1imsa/p1imsa-race-gapchart-delta-line-uses/. @Ken Ah, nice.. With respect to the comment on that post about “My original thinking behind its design was, to allow decision makers to quickly see if cars will be ahead or behind by seeing if competitors are currently above or below the dashed “pitstop delta” lines”, I had a probably not dissimilar rationale for the DRS line. Where the car ahead/car behind gap is of the order of the pit loss time, I could certainly make us of the lines, though I was also thinking of lines with uncertainty bounds associated with them.